The work that Andrew Clapp and others have done is helping to demystify the ancient black magick of Resonance (i.e. antenna building). And so, over last weekend, some friends and I decided to give it a go for ourselves. (standard disclaimer): Anything you do with your gear is YOUR RESPONSIBILITY. This is a stupid idea that will probably ruin your radio, set your house on fire, bring the FCC to your door, ruin your crops, and send famine and pestilence across the land. And as the operator, it is YOUR RESPONSIBILITY to not take the word of some raving lunatic on the web with funny colored hair, and find things out for yourself. Your mileage will vary. I'm probably lying. You have been warned. Anyway, our first run was a direct rip-off of Andrew Clapp's terrific original design (knowing next to nothing about antenna construction, it's helpful to start off with a working known good.) By using PVC, all-thread, washers, some cheap copper tubing, a Pringles can, and some scrap cardboard, we were able to make a prototype shotgun yagi in a matter of hours. Having a couple of other excited alpha geeks around can help move construction projects along very quickly. Once this was up and running, we looked at the design, and of course speculated about ways to optimize it. While a directional antenna showing between 12 and 15db gain is impressive, it's also pretty large, physically. 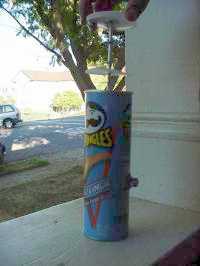 We realized that, if we were careful, we could fit a full wavelength inside the Pringles can itself (at a reduced total gain), but make the entire antenna much more compact. In about 45 minutes, we had the collector rod built, the locknuts on, and the whole thing in place. 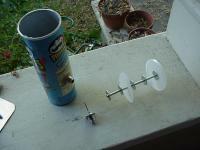 The result: A Pringles can that pulls about 12db! Of course, buying in bulk helps alot. You probably won't be able to find a 6" piece of all-thread; buy the standard size (usually one or two feet) and a 10-pack of washers and nuts while you're at it. Then, you'll have enough for two, for about $10. Practically speaking, what's the difference between the shortest pipe and the longest pipe length? about 0.02", or less than 1/32". That's probably about the size of the pipe cutter blade you're using. So, just shoot for 1.2", and you'll get it close enough. Cut the all-thread to exactly 5 5/8". 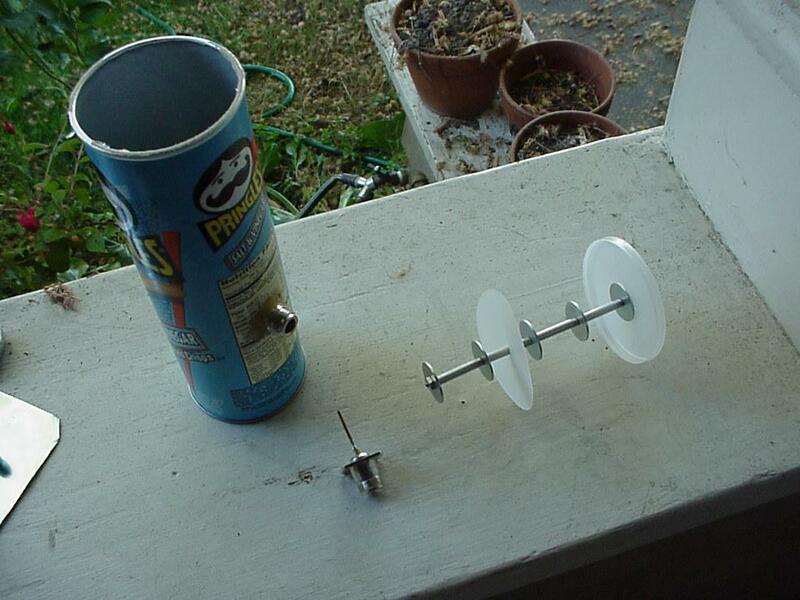 The washers we used are about 1/16" thick, so that should leave just enough room for the pipe, washers, and nuts. Cut a 3" plastic disc, just big enough to fit snugly inside the can. We found another Pringles lid, with the outer ridge trimmed off, to be ideal. Poke a hole in the center of it, and slip it over one of the lengths of pipe. Tighten down the nuts to be snug, but don't overtighten (I bent the tubing on our first try; aluminum bends VERY easily.) Just get it snug. Congratulations, you now you have the front collector. By now you should have eaten (or tossed) the actual chips. Wipe out the can, and measure 3 3/8" up from the bottom of the can. Cut a hole just big enough for the connector to pass through. We found through trial and error that this seems to be the "sweet spot" of the can. 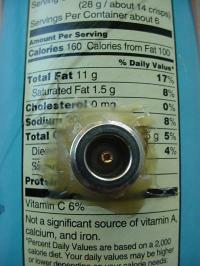 On the Pringles Salt & Vinegar can, the N connector was directly between Sodium and Protein. We were in a hurry, so we used hot glue to hold the connector in place. If you have a connector that uses a compression nut and washer, and you're really careful about cutting the hole, you could use that instead. Now, insert the collector assembly into the can, and close the lid. 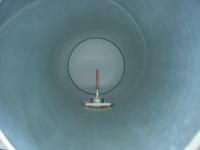 The inside end of the pipe should NOT touch the copper element; it should be just forward of it. If it touches, your all-thread is probably too long. Now, just read FCC Part 15.247, connect your pigtail, aim carefully, and have fun! Unfortunately, I don't have access to any of the necessary equipment (spectrum analyzer, power meter, or even an SWR meter) to properly evaluate the characteristics of the antenna. SWR in particular would be a really good idea to measure, as we're not sure how much power is feeding back into the circuit (too much and you can easily blow your transmitter.) With the extremely low power output (15dbm) of the Orinoco cards, I don't think this is too much of a danger, but remember, anything you do with your equipment is your responsibility, and at your own risk! Without the proper (multi-thousand dollar) tools, how were we able to estimate antenna performance? Using the Link Test software that comes with the Orinoco silver cards, you can see the signal and noise readings (in db) of a received signal, and your test partner's reception of your signal. As I happen to be 0.6 mile LOS from ORA headquarters, with very little noise on the channel between, we had a fairly controlled testbed to experiment with. We shot at the omni on the roof, and used the access point at ORA as our link test partner. When trying to aim a yagi (like our little can), keep in mind that they have large side lobes that extend up to 45 degrees from the center of the can. Don't point directly at where you're trying to go, aim slightly to the left or the right. We also found that elevating the antenna helped a bit as well. 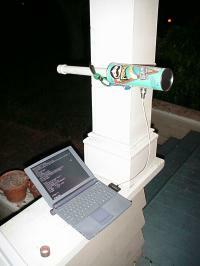 When aiming the antenna, hold it behind the connector, and SLOWLY sweep from left to right, with the Link Test program running. When you get the maximum signal, slowly raise the end of the can to see if it makes a difference. Go slowly, changing only one variable at a time. We haven't looked into weatherproof housing for the can; sinking the whole thing into some 3" PVC should do the trick. Of course, at $10 for two, it might just be more economical to replace them when they fail. Apparently, antennas of comparable gain cost upwards of $150. Over a clear line of sight, with short antenna cable runs, a 12db to 12db can-to-can shot should be able to carry an 11Mbps link well over ten miles. Rob Flickenger is a long time supporter of FreeNetworks and DIY networking. Rob is the author of three O'Reilly books: Building Wireless Community Networks, Linux Server Hacks, and Wireless Hacks. oreillynet.com Copyright © 2004 O'Reilly Media, Inc.